While our online store has been the main cash cow in our family, over the years MyWifeQuitHerJob.com has also become a significant portion of our household revenue. 2 years ago, I reached my first major blogging milestone by finally breaking the six figure income barrier after 4 long years of slogging away. That’s right. It took me 4 painful years of writing consistently to reach that point and I often questioned whether it was worth the effort in my post on How Much Money Do I Make Blogging And Is It Worth My Time? The good news is that cracking the 6 figure mark was not a fluke and the blog did even better this past year. In fact, I finally made more with my blog than with my day job which was an even bigger milestone for me. And if you consider that I only spend roughly 5 hours a week for my blog and online store course, the dollars per hour is almost an order of magnitude better than working for the man. In case you are wondering why I still work at my day job, it’s because I really enjoy the field of engineering. And one of the main reasons I go to work is to prevent myself from becoming obsolete. The world of computer hardware moves fast and if you stop and take a break, you might get left behind. That being said, I’m proud to say that I now go to work because I want to go to work and not because of the money! Anyways in case you are curious as to how I’ve been able to scale my blog and my income while simultaneously working a day job, running an online store and hanging out with 2 kids, the answer is simple. The only way to make a large sum of money without devoting a large number of hours is to leverage technology and automation in some way. So today, I’m going to show you how to use an email auto responder to gather leads and monetize your blog or website on autopilot. For all of you who do not know what an email auto responder is, it is a means of automatically delivering emails to your recipients at set intervals. The only requirement to make this work is that you need to sign up for an email marketing provider. You also need to start or have a blog. 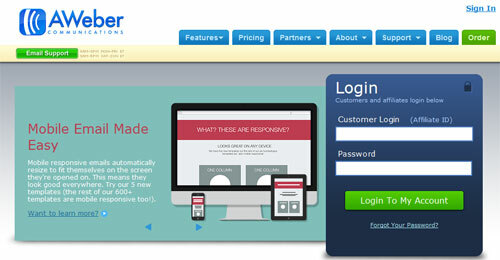 For my email needs, I use Aweber which the email provider that I recommend. For blogging and affiliate marketing, I believe that it is the best email marketing solution out there. But don’t take my word for it, give it a try for just a buck. Once you sign up, you are now ready to follow my video tutorial below. The following video is a recording of a talk that I gave at the Financial Blogging Conference this past October. It was my very first time speaking and it was one hell of a rush being up there on stage. I had an absolute blast! Anyways, the talk was well attended and PT (the founder of the conference) told me that it was one of the most popular talks at the entire conference. If you are reading this PT, thank you for giving me the opportunity to speak at your conference. It was an honor. The other thing I want to do is to thank all of you for sticking with me all of these years. You have made all of this possible and I really appreciate it. The moral of the story here is that you can’t just write posts for your blog and expect the money to just roll in. For every blog in existence, there are only going to be a handful of money posts. And unless you manage to steer your readers to these posts, you will never be able to make more than just spending cash with your blog unless you have a gigantic audience. In any case, I hope you enjoyed the video. I will be at the Financial Blogging Conference again next year and will most likely be speaking for a second time. If you do plan on attending, send me an email and look me up. I would love to be able to meet you face to face. Great post! Thanks for all the valuable info you’ve provided! Got some great tips Steve. Thanks for the vid for those who cant make it to the conferences. THank you Jae. There were a lot of other fantastic talks at FinCon as well. Not sure if they are posted on the website. I watched the entire video, it was awesome! Great presentation. THanks Judy. I wasn’t sure how many people would have the patience to watch a 45 minute video:) Attention spans are short these days. Saved! I sorely need to work on my autoresponder. Thanks for posting. THanks Glen. Was great seeing you there this year. Steve, you’re such an inspiration! Great video Steve, it is interesting to learn about the psychology behind the purchasing decision. I have considered aweber for a project I am working on and will of course use your link as a give back for sharing your info. Thanks Terry. The psychology of selling is actually a very interesting topic. Perhaps I’ll expand upon what I’ve learned in future blog posts. Great presentation! I never tire of hearing what you have to share and always learn something new. I also prefer text over video! I was surprised that most people prefer video. Really enjoyed the talk Steve and wish I could have been there. I have always been awful with sign ups and affiliates and realise I need to get my act together. Great video. 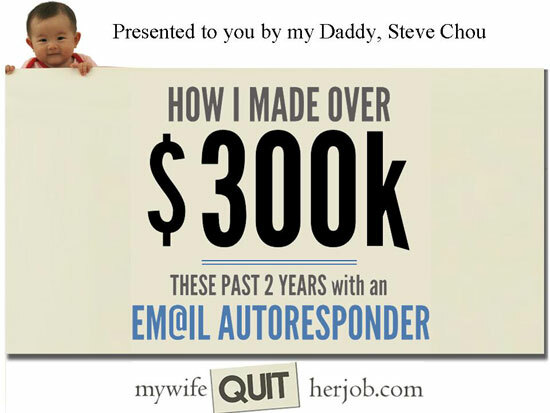 I have been wondering how others structure an auto-responder. I’m eager to see how I can incorporate some of your ideas into mine. The Pat Flynn podcast you referred to was a huge help to me as well. A suggestion, if I may. It would be helpful to type out the questions from the audience onto the screen, since they can’t be heard in the video. This presentation was awesome, truly inspiriting.